There are today new kinds of struggles organized by the actors of the civil society. The altermondialist movement illustrates these new kinds of struggles. Nowadays, the objectives of these struggles are to force change at levels of decision-making that are well above those in which one can participate by the usual democratic mechanisms. The objectives encompass not only national but international issues – the latter no less fundamental to solving immediate problems. These new struggles need new ideas, new tools. The experiences of the Social Forums illustrate both this need and the associated challenges : How to we capitalise on the extraordinary creative energy that is developed at the Forums ? How do we avoid falling for the propaganda or in the supermarket of ideas choose from among the many supposed alternatives ? How do we avoid the frustration and failure that will come from the impossibility of making realistic proposals ? How do we create a common vision, a common objective, while cultivating and maximising the diversity of contributors ? The acceleration of the transformation processes affecting both societies in general and their relationship to land and natural resources means that we must put in place a bold and voluntarist strategy. There is an urgent need to generate the processes and mechanisms that will allow citizens concerned to build new principles of governance. In order to encourage active participation in promoting the kind of profound changes in resources governance that are necessary, campaigns need to be anchored in local needs and realities in each location, while taking into account national and international issues. Because it is essential to consider a huge diversity of situations (ecological, economic, social, legal, cultural, historic) in order to make innovative proposals, AGTER conceives its work on a global scale. The originality of this way of working consists of learning from what’s really happening in different locations, while searching for the points that we have in common that rise above the differences. 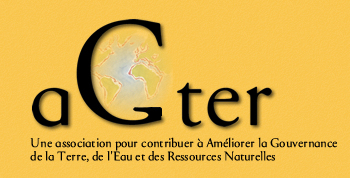 The purpose of AGTER is to participate to the elaboration of new ways of governance of land and natural resources aimed to address the challenges resulting from the emergence of new needs (see the article "News forms of struggles and new needs"). Facilitate exchanges and spread of ideas between actors and organizations, in particular those belonging to the civil society. Through this approach, AGTER intends to contribute to the emergence of a permanent learning process helping organisations of the civil society (in particular fishermen and farmers organisations) to formulate proposals related to land tenure and natural resources management, and to put them into practice.